What Does This Graph Tell US About Climate Sensitivity to CO2? 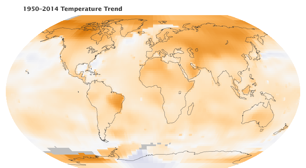 What Does NOAA’s Warmest Year Tell Us About Climate Sensitivity to CO2? A friend of mine who works for the EPA emailed me a link to NASA’s Earth Observatory page pitching 2014 as the warmest year on record, and asked if “I dismiss their findings.” The following is an edited version of my reply suggesting the Global Average Chimera tells us precious little about the climate’s sensitivity to CO2, and the uncertainty is far greater than the error bars illustrated in Anthony Watts post 2014: The Most Dishonest Year on Record. I simply asked my friend to consider all the factors involved in Gavin Schmidt’s making of the global average temperature trend, and ask you all to do the same. Then decide for yourselves the scientific value of the graph and if there was any political motivation. 1. Consider the greatest warmth anomalies are over the Arctic Ocean because more heat is ventilating through thinner ice. Before the Arctic Oscillation removed thick insulating sea ice, air temperatures were declining. Read Kahl, J., et al., (1993)Absence of evidence for greenhouse warming over the Arctic Ocean in the past 40 years. Nature 361, 335 – 337. CO2 advocates suggest CO2 leads to “Arctic amplification” arguing dark open oceans absorb more heat. But the latest estimates show the upper 700 meter of the Arctic Ocean are cooling (see illustration below), which again supports the notion ventilating heat raised air temperatures. Read Wunsch, C., and P. Heimbach, (2014) Bidecadal Thermal Changes in the Abyssal Ocean, J. Phys. Oceanogr., http://dx.doi.org/10.1175/JPO-D-13-096.1. So how much of the global warming trend is due to heat ventilating from a cooling Arctic ocean??? 2. 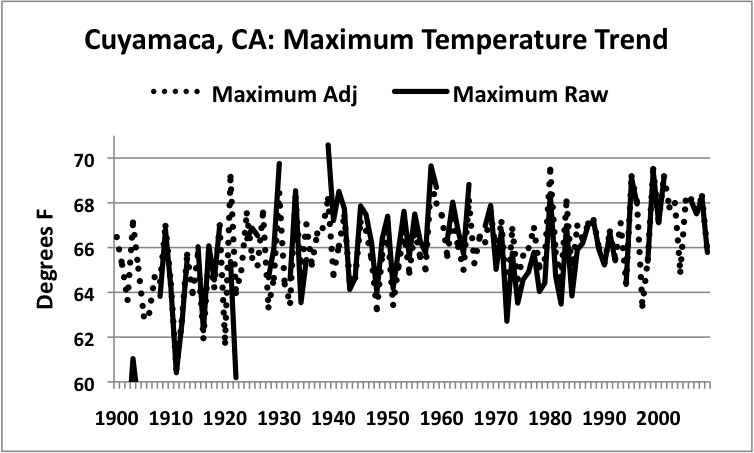 Consider that NOAA’s graph is based on homogenized data. Researchers analyzing homogenization methods reported “results cast some doubts in the use of homogenization procedures and tend to indicate that the global temperature increase during the last century is between 0.4°C and 0.7°C, where these two values are the estimates derived from raw and adjusted data, respectively.”Read Steirou, E., and Koutsoyiannis, D. (2012) Investigationof methods for hydroclimatic data homogenization. Geophysical Research Abstracts, vol. 14, EGU2012-956-1. So how much of the recent warming trend is due to the virtual reality of homogenized data??? 3. Consider the results from Menne. 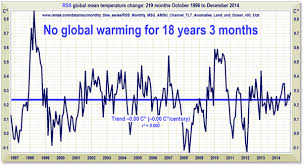 M., (2009) The U.S. HistoricalClimatology Network Monthly Temperature Data, version 2.The Bulletin for the American Meteorological Society, in which they argued their temperature adjustments provided a better understanding of the underlying climate trend. Notice the “adjusted” anomalies in their graph below removes/minimizes observed cooling trends. More importantly ask why does Menne (2009) report a cooling trend for the eastern USA from 1895to 2007, but NASA shows a graph (below Menne’s) with a slight warming trend for all of the USA from 1950-2014? Does that discrepancy indicate more homogenization, or that they cherry-picked a cooler period to start their warming trend? 4. Consider that most of the warming in North America as illustrated by Menne 2009 (above) happened in the montane regions of the American west. 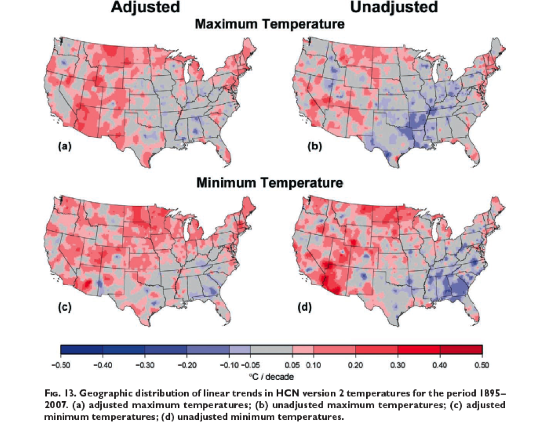 Now consider the paper Oyler (2015) Artificial amplification of warming trends across the mountains of thewestern United States, in which they conclude, “Here we critically evaluate this network’s temperature observations and show that extreme warming observed at higher elevations is the result of systematic artifacts and not climatic conditions. With artifacts removed, the network’s 1991–2012 minimum temperature trend decreases from +1.16°C/decade to +0.106°C/decade. 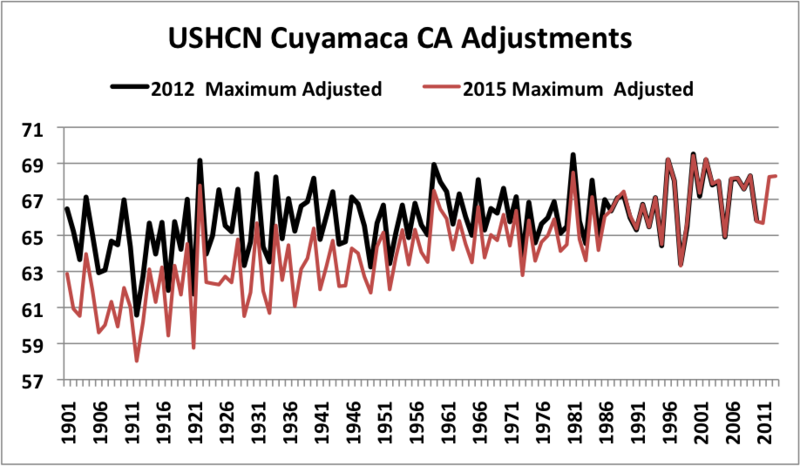 So how much of the recent warming trend is due to these systematic artifacts??? 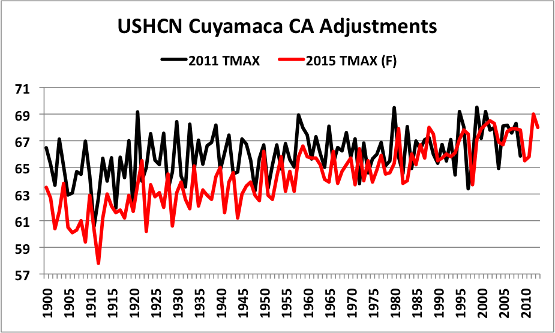 Just 2 years later, the 2011 homogenized century warming trend (in black ) increased by more than 2°F in the 2015 trend (in red.) I have archived several other similar examples of this USHCN datamanipulation. Then ask your self which is more real? The more cyclical changes observed in non-homogenized data or the rising trend created by homogenized virtual reality? 6. Consider that climate change along western North America has been completely explained by the Pacific Decadal Oscillation and the associated cycles of ventilation and absorption of heat. Read: Johnstone and Mantua (2014) Atmospheric controls on northeast Pacific temperature variability and change, 1900–2012. Such research suggests non-homogenized data may better represent climate reality. Knowing that the upper 10 feet of the oceans contain more heat than the entire atmosphere ask yourself if decadal warming trends are simply artifacts of the redistribution of heat. So how much of this recent warming trend can be attributed to increases in Impervious Surface Area in and around weather stations in rural, suburban and urban settings? 8. Consider that direct satellite observations show lost vegetation has a warming effect, and transitions from forest to shrub land, or grassland to urban area raise skin surface temperatures by 10 to 30°F. Satellite data reveals the canopies of the world’s forests averaged about 86°F, and in the shade beneath the canopy, temperatures are much lower. Grassland temperatures are much higher, ranging from 95 to 122°F, while the average temperatures of barren ground and deserts can reach 140°F. ReadMildrexler, D., et al. (2011) A global comparison betweenstation air temperatures and MODIS land surface temperatures reveals thecooling role of forests. J. Geophys. Res., 116, G03025, doi:10.1029/2010JG001486. Ask yourself, “how much of the warming trend is due to population effects that remove vegetation? ?” How much is due to citizens of poorer nations removing trees and shrubs for fuel for cooking and heating or slash and burn agriculture? 9. 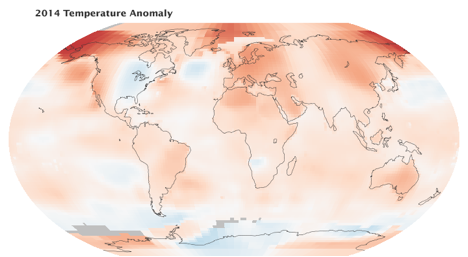 Consider that neither of the satellite data sets suggest 2014 was the warmest ever recorded. 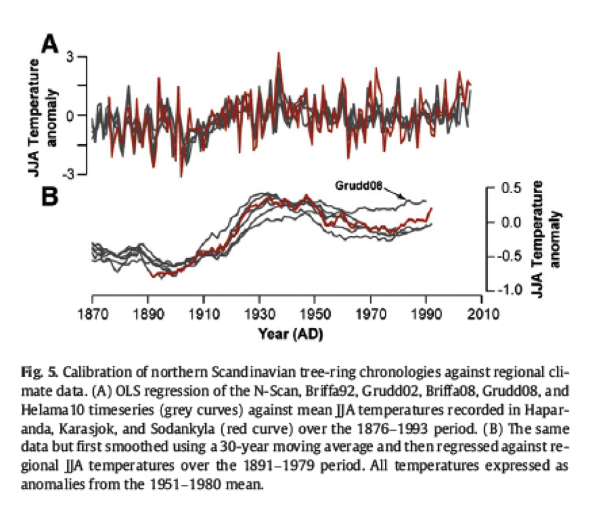 Consider international tree ring experts have concluded, “No current tree ring based reconstruction of extratropical Northern Hemisphere temperatures that extends into the 1990s captures the full range of late 20th century warming observed in the instrumental record.” Read Wilson R., et al., (2007) Matter of divergence: tracking recent warming at hemispheric scalesusing tree-ring data. 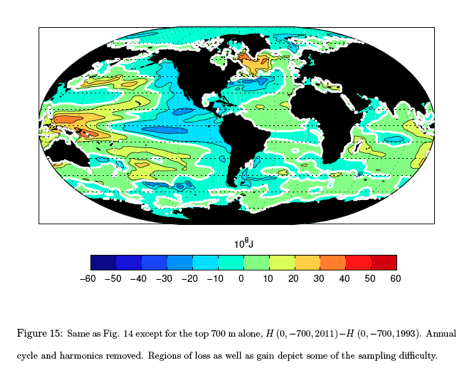 Journal of Geophysical Research–A, 112, D17103, doi: 10.1029/2006JD008318. 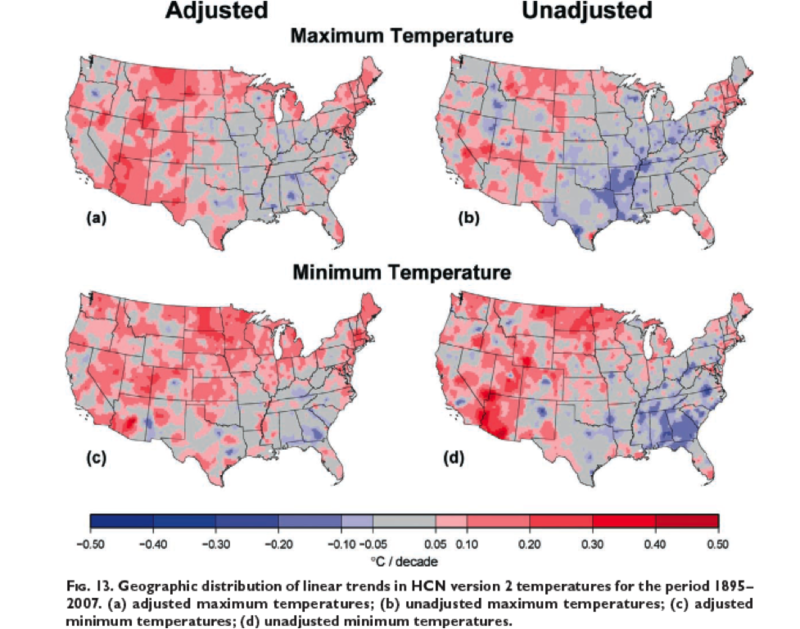 In summary, after acknowledging the other factors contributing to local temperature change, and after recognizing that data homogenization has lowered the peak warming of the 30s through the 50s in many original data sets by as much as 2 to 3°F, (a peak warming also observed in many proxy data sets less tainted by urbanization effects), ask yourself, does NOAA’s graph and record 2014 temperatures really tell us anything about climate sensitivity or heat accumulation from rising CO2? Or does it tell us more about climate politics and data manipulation?